Each day when you start your Windows system you see your desktop background wallpaper image. From time to time, when you don't like it any more, you should change it. Sometimes you do not recognize that you used the same one since months. Sometimes the reason is that you don't have the time or you are not in the mood to look for a new one. So the old one is kept though you might be bored by seeing it again and again. Nowadays, masses of images are located on PCs. You make photographs on holiday trips, you get pictures from your family or you collect your favorite sports or celebrities' snapshots from online sources - all these images are just waiting to be used as your desktop wallpaper, and if this could change automatically you would be happy to be surprised with a new one on a regular base. 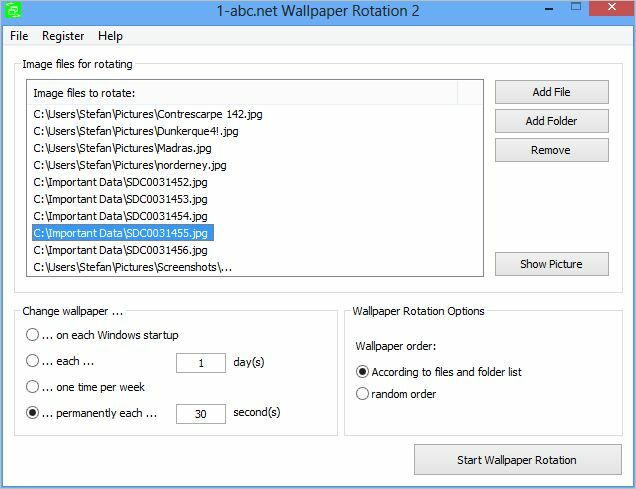 1-abc.net Wallpaper Rotation allows you to add as many picture files as you like and the program will change your desktop background image automatically as often as you wish! You can also add complete folders to this list (like a path to your latest holiday pictures) and the program takes a nice desktop wallpaper from there. You can decide if you want to get a new one on each Windows startup, after a week or after a period of any specific amount of days or even seconds. There is also an option to let the program shuffle the order or if your images from the order provided by your file list are used. Starting such a wallpaper rotation process is just one click and stopping it is just another one. The program does not modify your system in deep, it is just executed when you boot your Windows and it turns itself off when there is nothing more to do for it. When you use permanently changing desktop wallpapers it is minimized to your systray and can always be maximized or closed from there. 1-abc.net Wallpaper Rotation surprises you with a new desktop wallpaper as often as you like!